Langer employs a full time, on staff Safety Director. He is responsible for keeping the company in compliance with all OSHA and other regulatory statutes at all times. All of our roofing and sheet metal tradesmen take part in ongoing safety training and receive pre-hiring and periodic drug testing. All of our roofing tradesmen are Certa-torch trained as well as State of Wisconsin asbestos abatement certified. All personnel who operate our trucks, tankers and boom trucks are required to have a Commercial Drivers License. Langer is a charter member of the Association of General Contractors Safety Leaders Forum. Proudly, Langer boasts one of the best safety records in the industry. Over the past 10 years we’ve averaged an insurance Experience Modification Rating (EMR) of 0.61. Our current EMR is 0.61. Fumes from a roofing kettle are difficult to control in an outdoor environment. The Garlock FumeGuard Control System helps minimize fumes and odor when heating asphalt or coal tar pitch for the hot roofing process. This can be especially important to building occupants in school, office and health care settings. 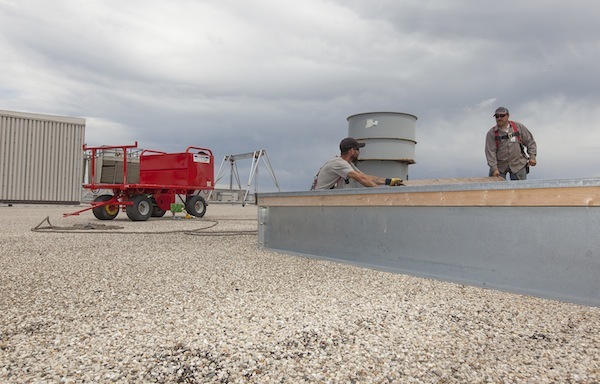 To help ensure the safety of our tradesmen, Langer has invested in multiple AES Raptor R1000 fall protection systems, which comply with OSHA fall arrest requirements and can be moved to various locations on a flat roof. Their mobility makes them versatile enough to use on projects with limited tie-off options for fall restraint.